I really like the contrast that comes from the images of Rosie and Shamus. 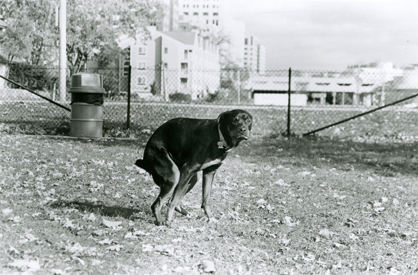 The pooping picture of Rosie is perfect, but I would like to see it matched up with the Shamus poop picture. I like the tone of your grays but I’m a little confused on the intended concept. The dogs seem to be caught in normal situations but in awkward poses, if you wanted to capture the awkwardness of dogs I think just taking more photos of your subjects would have gone the trick. I suggest trying take photos in motion since dogs are often energetic creatures… as the photos stand now they are a bit too documentary. 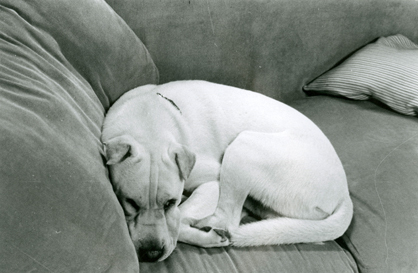 The juxtaposed images in this post are very interesting to me… while they are both dogs, one looks sweet and innocent curled up on a couch – probably one of the most common positions that we see dogs in photos usually. However, the other photo is a pose we don’t see as often because it is a more taboo action. I wonder if this was your intent in choosing these two photographs or if you had some other reason for putting these photos together. The second also looks more like a stray verses the house dog in the first. I found the image of Rosie very funny. Although this may not have been your original idea, I believe it is difficult to photograph comedy. This is a photo any dog owner/lover can relate to. I can imagine the thoughts Rosie’s having realizing she’s being exposed in her most vulnerable moment. I found the bottom image funny. Nice usage of contrast.